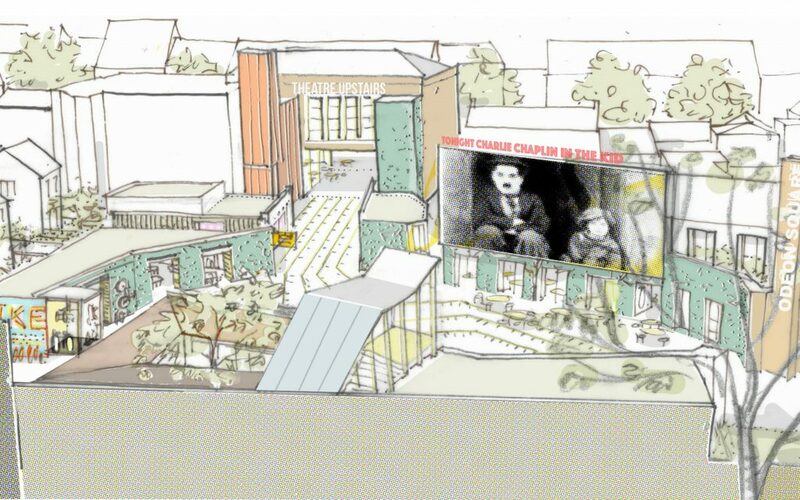 Following the discussion at the June 2018 meeting of the South Ashford Community Forum, Ashford Borough Council have published emerging proposals for the former Mecca Bingo / Odeon site. The Council would like to hear your views. This document forms South Ashford Community Forum’s (SACF) response to the Draft Recommendations produced by the Local Government Boundary Commission for England (LGBCE) as part of an Electoral Review of Ashford Borough Council. SACF objects to the warding proposed for the unparished area of South Ashford as it fails to address the issues identified in its submission to the Consultation on Warding Arrangements (previous submission) and exacerbates the separation of the Watercress area from the rest of the ward. The LGBCE has failed to acknowledge SACF’s previous submission in its report on the Draft Recommendations. SACF has reviewed the data used in its previous submission and adjusted the number of voters likely to arise from new development to align with Ashford Borough Council’s Housing Trajectory. Although this gives a reduced electorate, compared with that forecast in the previous submission, it is still considered that the unparished area of South Ashford warrants five full seats in the Council and presents a proposal which resolves the issues identified in the previous submission. With the exception of Figure 4, the maps we have used have been created using Google Maps. Clicking on the map image will link to the online maps. The LGBCE Draft Recommendations for wards for South Ashford are illustrated in Figure 1. 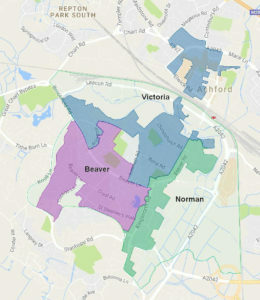 A small change to the boundary of Beaver with Norman Ward to bring the whole of the extended Farrow Court into Beaver Ward. 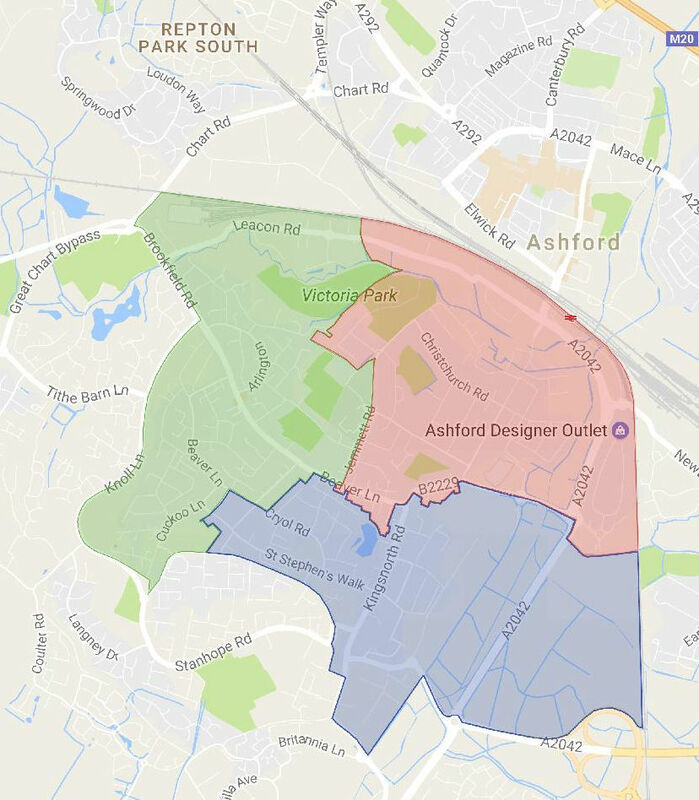 The shapes of the district council wards that serve the unparished area of South Ashford have long been a concern of South Ashford Community Forum. The proposals put forward in this document seek to rectify the issues created by the shapes of the existing wards, whilst accounting for a likely increase in the electorate. The Victoria Ward includes the town centre, the Christchurch area and the north-west part of the Brookfield Estate with Watercress. The Town Centre is separated from the remainder of the Ward by the Charing Cross to Ashford railway line. Whilst the Beaver Road (Station) Bridge lands within the ward to the north and south of the railway, it is a busy dual carriageway and acts more as a division between the communities than a link. The communities of the Brookfield and Watercress estates are physically separated from those of Christchurch area by the open space of Victoria Park and the sites of the Ashford College and South School. The only roads linking the two are Brookfield Road/Beaver Lane that passes through Beaver Ward and Leacon Road / Victoria Road that forms the spine road for the Chart Industrial Estate and does not form a satisfactory community link. The Norman Ward has a large land area, most of which is undeveloped or comprises commercial development. Two distinct residential communities of Torrington Road and Hampden are separated by industrial / retail estates. These issues are represented in Figure 3 that shows the wards excluding the areas that have no no dwellings. In addition to the topological issues, four of the eight Lower Layer Super Output Areas (indicatedin Figure 4) that make up the unparished area ofSouth Ashford, including those covering Brookfield and Watercress, are among are the 20% most deprived in England (Department for Communities and Local Government, 2015) and therefore have needs very different to those of the town centre. Inclusion of these topologically and socially disparate areas renders effective representation of the electorate in those areas more difficult for councillors. 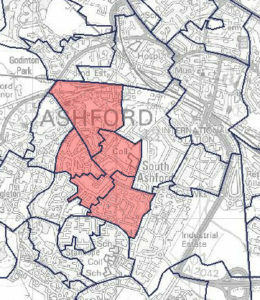 a larger area of the ward is north of the Charing Cross to Ashford Railway line, which is likely render effective representation of the electorate in South Ashford more difficult for councillors. The proposal makes no substantive change to Norman Ward, hence fails to address the concerns expressed in our previous submission. “We received two submissions concerning the area of Furley and Victoria, from the Council and a local organisation. The two submissions proposed differing boundaries. SACF is aware of three submissions relating to Victoria Ward, ABC’s, one by Central Ashford Community Forum and our own. A similar statement in the Report relating to Beaver and Norman Wards leads us to believe that the SACF submission has been disregarded. We do not believe that sufficient account has been taken of new development within the proposed Victoria Ward boundaries. 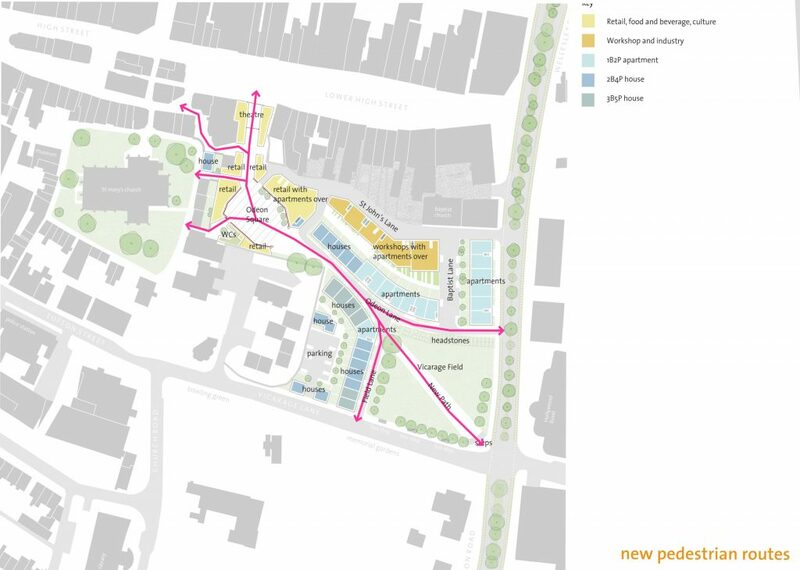 There are four major residential developments currently under way or planned in that part of the proposed Ward that lies north of the Charing Cross to Ashford railway line: Panorama, Trafalgar House, Godinton Way and Elwick Place. Based on the submitted planning applications and the Housing Trajectory included in ABC’s Draft Local Plan (Ashford Borough Council, 2016) these add 520 dwellings to the ward. This does not take into account a number of smaller conversions of commercial premises to residential under way or proposed. There are three major developments for which planning applications have been submitted within the ward in South Ashford: the Powergen Site, Victoria Way East and the Travis Perkins sites. A further site, Leacon Road, is shown in the Council’s Housing Trajectory as being developed before 2022. The Powergen site, for which planning permission has been granted, comprises 660 residential units, however the Housing Trajectory indicates that 250 of these are planned to be complete by 2022. We included the whole of this development in the estimate of the electorate given in our previous submission. Victoria Way East, for which planning permission is pending completion of a Section 106 agreement, includes 216 units. The Travis Perkins sites for which permission is also pending completion of a Section 106 agreement, comprises 59 units. This site is not included in the Council’s Housing Trajectory. 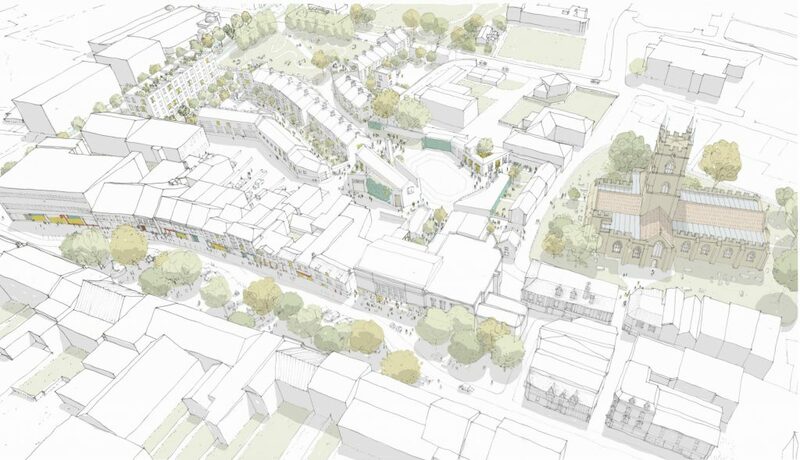 Leacon Road is shown in the current and Draft Local Plan as including 100 residential Units. The total number of dwellings due to be completed by 2022 in these South Ashford, Victoria Ward developments is 625. This excludes small infill developments. Victoria Ward had 3,968 voters in February 2016. The change in boundaries creates a net reduction of 182 existing voters compared with the existing ward, giving 3,786 existing voters in the ward as proposed in the Draft Recommendations. The Draft Recommendations Report gives the 2022 electorate as 4,103 thus allowing 317 additional voters. From 4.1 above the total number of new dwellings planned is 1145. This implies that the the Draft Recommendations include a provision 0.28 voters for each new dwelling. The developments in the town centre are mainly flats hence we propose a conservative estimate of 1.5 voters per dwelling this would increase the electorate by 781 voters. The developments in the South of the Ward are of mixed types and sizes, hence we believe that the number of voters per unit will be similar to the existing in South Ashford at 1.9, hence adding 1187 voters to the ward. We therefore estimate that 1968 voters arise from new development, giving a total of 5754 (35% above the Borough average). The LGBCE’s report states that only one submission was made in relation to Beaver and Norman Wards, that being Ashford Borough Council’s again apparently ignoring SACF’s submission. 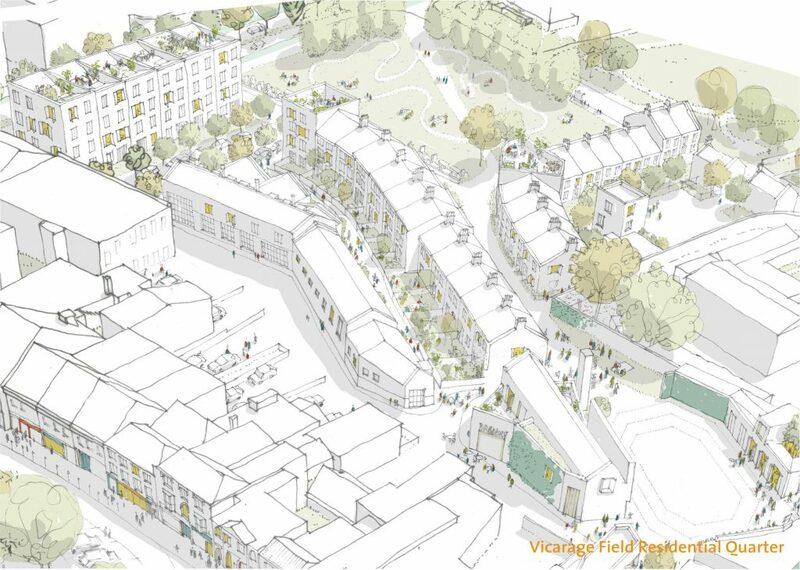 The proposals move Arlington, Boxley and Clockhouse to the existing ward from Victoria Ward. From data obtained from Ashford Borough Council there were 449 voters in these streets. The small change at the boundary with the Parish of Great Chart with Singleton moves 9 voters out of the ward. There is a small change at its boundary with Norman Ward to include the whole of the extended Farrow Court sheltered housing accommodation. This redevelopment will increase the number of occupants. It is understood that Phase 1 of the development was complete and occupied, comprising 33 flats within which there were 26 voters. A further 51 flats were still to be built, from which we estimate an additional 40 voters would be added to the ward. The Council’s Planning Committee voted to permit the redevelopment of the Ashford College site in Jemmett Road in 2011. This permission was granted in December 2016, when the Section 106 Agreement was signed. The College will move to new premises in September 2017. The developer has indicated that he intends to construct approximately 160 dwellings of mixed size. We estimate that this will add 304 voters to the ward. 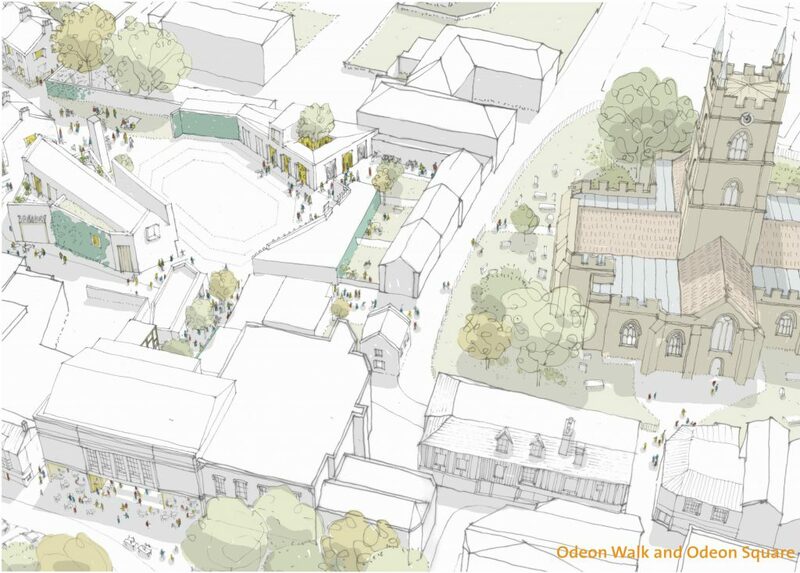 Our submission to the Consultation on Warding Arrangements included the site adjacent to the College site, the South School Site. However the Council’s Housing Trajectory shows this as being developed later than 2022. The Council’s submitted data gives an electorate of 4242 voters in 2016. There will be a net gain of 440 existing voters, giving a total of 4682 existing voters. 344 voters will be added as a result of development giving a total electorate of 5026, 18% above the borough average. Norman Ward is unaffected by the proposals other than the change to the Boundary with the Parish of Kingsnorth, which does not affect any existing or planned voters, and the small change to the boundary with Beaver Ward. 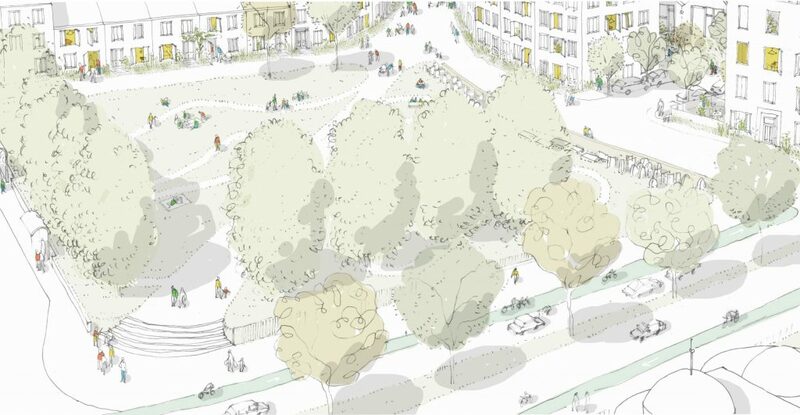 The only substantial planned residential development in the Ward is 38 dwellings on the site of Concorde House, Austin Road, which could add 72 voters to the Ward. The electorate will increase from 2074 in 2016 to 2146 in 2022, less than 1% variance. Taking into account the development identified in 4 above the total electorate in the unparished area of South Ashford will be 10528 in 2022 less than 1% below the average for five councillors. Whilst we would prefer that single seat wards were used we have been unable to identify suitable ward boundaries to create five single seat wards. It is therefore proposed that three wards are created, two of two seats and one of one seat. Ward boundaries are arranged to, as far as is practical, resolve the issues raised regarding the existing wards. The proposed wards are shown in Figure 5. The wards proposed are compact, with good road links within the wards, thus assisting effective representation. 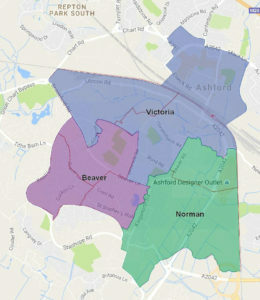 SACF has not carried out a detailed analysis of the changes to the Central Ashford wards, other than the impact of development and proposed changes and development on the Central Ashford part of Victoria Ward detailed in 4.1 above. From that analysis the electorate in the north part of the Victoria Ward as proposed in the Draft Recommendations will be 1,917. That in the proposed Furley Ward will be 4,628. Summing these figures gives a total of 6,364. This is equivalent to 11 voters below the proposed average for three councillors. The size of the town centre ward could be balanced to a single seat ward by reinstating all or part of the area moved to Furley Ward in the Draft Recommendations. the unparished area of South Ashford is represented by five councillors serving two, two seat wards and one single seat wards as illustrated in Figure 6.
the boundary of district wards to the south of the unparished area is aligned to be coterminous with the boundary of the Parish of Kingsnorth. The proposal will create the need for an extra seat on the Council. Ashford Borough Council. (2016). Draft Local Plan – Regulation 19 Version. Ashford, Kent. Department for Communities and Local Government. (2015). The English Indices of Deprivation 2015. London. South Ashford Community Forum have started a review of the Draft Local Transport Plan prepared by Kent County Council. A copy of the response is available at https://southashford.org.uk/index.php/category/consultations/kltp/ or can be downloaded as a pdf. To deliver safe and effective transport, ensuring that all Kent’s communities and businesses benefit, the environment is enhanced and economic growth is supported. Q3. 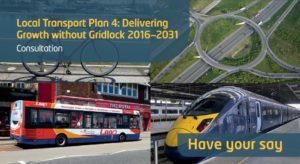 To what extent do you agree or disagree with the overall Ambition set for the Local Transport Plan? Q4. This Ambition will be realised through five overarching Outcomes and Supporting Policies. To what extent do you agree or disagree with each of the Outcomes and Policies? Outcome 1. Economic growth and minimised congestion. Policy: Deliver resilient transport infrastructure and schemes to reduce congestion and improve journey time reliability, to enable economic growth and appropriate development. Outcome 2. Affordable and accessible door to door journeys. Policy: Promote affordable, accessible and connected transport to enable access for all to jobs, education, health and other services. Policy: Provide a safer road, footway and cycleway network to reduce the likelihood of casualties, and encourage other transport providers to improve safety on their networks. Policy: Deliver schemes to reduce the environmental footprint of transport, and enhance the historic and natural environment. Outcome 5. Better health and wellbeing. Policy: Promote active travel choices for all members of the community to encourage good health and wellbeing, and implement measures to improve local air quality. Crossrail extension from Abbey Wood to Dartford, Ebbsfleet and Gravesend. Whilst we support improvements to public transport to serve the development in the Thames Gateway and believe that travel by road should be constrained to limit the impact of the development on the strategic road network we would object to expansion of High Speed Rail Services to Ebbsfleet at the expense of those to Ashford. The existing Dartford Crossing is the shortest freight route between Kent and the major distribution centres in the Midlands and the North. However, the capacity is overloaded for large periods of the day and it is extremely vulnerable to incidents – over 300 times a year the Crossing is fully or partially closed. Due to congestion and delays, it affects productivity and constrains economic growth. We are clear that a new Lower Thames Crossing, to the east of Gravesend, is required to unlock growth, improve journey time reliability, improve network resilience, and enable opportunities for regeneration. In the 2016 consultation, our response was adamant that the Western Southern Link should be chosen and that with careful route alignment and tunnelling, the environmental and heritage impacts could be substantially minimised. As part of the project to deliver the new Lower Thames Crossing the A229 between M2 Junction 3 and M20 Junction 6 should be upgraded (what has previously been called Option C ‘variant’) along with improvements to the A249 as another link between the two motorways and the upgrades identified for ‘bifurcation of port traffic’ set out in the next section. It is vital to the UK economy that the Channel Corridor operates efficiently at all times and is resilient to incidents on the network. Port traffic is currently routed along the M20/A20, which results in severance between Dover town centre and the harbour. With the construction of a new Lower Thames Crossing, a second strategic route will be available between Dover and the Midlands and North. The project to revive the Dover Western Docks plus expansion of the existing Port would naturally split traffic so that for the Western Docks and Channel Tunnel would use the M20/A20, and traffic for the Eastern Docks would be encouraged to use the M2/A2. Bifurcation will also facilitate growth of Whitfield, Folkestone, Ashford and Maidstone by releasing capacity on the M20. M2 Junction 7 (Brenley Corner) improvements to improve capacity and provide free-flow between the M2 and A2. Dualling sections of single carriageway on the A2 north of Dover along Jubilee Way to Whitfield and near Lydden. M20 Junction 7 improvements to provide ease of access between the A249 and M20. M2 Junction 5 Stockbury improvements to provide free-flow between the M2 and A249. The Government’s Port Policy Review Interim Report forecast a 101% increase in roll on – roll off ferry traffic by 2030 (HGVs and LGVs driving on and off ferries). To accommodate this growth, constraints in the south east’s capacity for short-sea routes to the Continent have to be overcome. Dover Harbour Board’s master planning has shown that the existing Eastern Docks would not provide sufficient capacity and therefore the Port plan to redevelop the Western Docks. The Western Docks will provide a cargo terminal with a port-centric distribution centre, allowing the existing cargo operations to move out of the Eastern Docks so that capacity within the existing dedicated ferry terminal can be increased. The redevelopment would also kick-start the regeneration of Dover town, attracting investment, creating jobs and improving the appearance of the Waterfront. The scheme will remodel the Prince of Wales and York Street roundabouts on the A20. Whilst we agree with the need to accommodate traffic growth at the Port of Dover we consider that more research and investment should be provided into expansion of rail freight through the Channel Tunnel and the County to minimise the need for increased road capacity. Use of road pricing for HGV vehicles should be investigated as a means to balance the economic advantages of road use over rail. This should be accompanied by a reduction in Vehicle Tax for HGVs to offset the cost increase for UK operators. When there is disruption at the Port of Dover or Eurotunnel, Operation Stack may be implemented and sections of the M20 closed to hold lorries. The impacts are estimated to cost the Kent and Medway economy over £1.5m per day, with the wider costs to the UK economy being much greater. When the motorway traffic is rerouted onto M2, A20 and the local road network it has detrimental impacts on the communities along these routes. The use of Operation Stack creates a negative perception of Kent as a place to do business. We are working with Highways England who is leading on the delivery of a Lorry Area that will reduce the need to use the M20 to queue freight vehicles during times of disruption to cross-Channel services. In addition to this work, we will lobby for more freight to be transported by rail although we acknowledge that limited train paths for rail freight and the economics of transporting goods by roads limits the scope for significant modal shift. We agree that Operation Stack must be addressed urgently to stop the impact, not only on the strategic road network but also on the local roads that are used as diversion routes during Operation Stack and its the economic consequences. Work must be continued beyond the current proposal which is acknowledged by Highways England to provide capacity for only half of the potential current requirement. Research and investment must be provided into the use of technology, to control entry of freight vehicles into the county, a national strategy to address lorry parking and development of rail freight to reduce the potential increase in HGV traffic. Kent has a high demand for lorry parking spaces because of its connectivity to continental Europe attracting high volumes of cross-Channel freight. We are developing a strategy for a network of small lorry parks at suitable locations across Kent and a partnership approach with the Districts and the Police to address enforcement. The proposed Operation Stack Lorry Area adjacent to the M20 at Stanford should be integrated with this overall strategy. This strategy should also include improved management of freight traffic through Kent utilising technology to direct HGVs to parking sites and available cross Channel services, i.e. ‘ticketing’ flexibility between Eurotunnel and ferry operators to ensure optimum fluidity of freight movement. Combined with a multi-agency approach to enforcement, the provision of additional lorry parking capacity will reduce antisocial behaviour on the public highway, including littering. This will also reduce unsafe lorry parking, such as vehicles overhanging laybys, and so improve road safety. KCC must push for its strategy for HGV parking to be extended throughout the South East and beyond, to allow management of HGV movement into the County at times of excess traffic flow. Ashford International Station is linked to High Speed 1 by two sections of railway known as the Ashford Spurs. The signalling on these spurs needs to be upgraded to permit the operation of the new Eurostar Class e320 trains into Ashford International Station. We, working in partnership with Ashford Borough Council, have led a working group with all concerned stakeholders to fund, procure and deliver an upgrade to the signalling system. The delivery of the upgraded signalling system by Network Rail will enable Ashford to continue to operate as an international station, serving the new fleet of Class e320 Eurostar trains, as well as any future international rail operators such as Deutsche Bahn. The districts of Canterbury, Dover, Shepway and Thanet together form East Kent. The area suffers from increased deprivation when compared with West Kent, and the wider South East. Poor accessibility has discouraged major employers from locating in the area, and prevents regeneration. We are seeking to deliver a new railway station to significantly improve rail connectivity to the area. The station will provide access to greater employment opportunities for local residents, increase the attractiveness for investment in Discovery Park Enterprise Zone and numerous surrounding business parks in Thanet, and support local housing growth including Stone Hill Park on the former Manston Airport site if this is granted planning permission. The estimated journey time from Thanet Parkway to London St Pancras will be just over 20 minutes shorter than that from Deal to London St Pancras, therefore a new station enhances the accessibility of the wider area of East Kent.Rail connectivity between London, Ashford and Thanet will be improved by delivery of the Journey Time Improvement (JTI) scheme. This aims to reduce the journey time between Ashford and Ramsgate. The first phase, between Ashford and Canterbury West, is due for completion by May 2017; the second phase, between Canterbury West and Ramsgate, is due for completion by 2019/20. We need a public transport system that is integrated, affordable, and therefore an attractive option for our residents. One barrier for many people is the cost of commuting by train, which can prevent people from being able to access employment, particularly in London. This is known as the ‘rail price penalty’ and we will work with Government and the rail franchisee to identify options to reduce this. We have made good progress on promoting improvements to rail passenger services through the Rail Action Plan for Kent, and this has led to KCC being recognised as a voice of authority on rail matters for the South East. We will now work to influence the new South Eastern rail franchise (2018) as well as continuing to run annual Rail Summits to stand up for Kent’s passengers. We support the proposal for an extension of Crossrail 1 from Abbey Wood to Dartford, Ebbsfleet and Gravesend ensuring the delivery of additional rail capacity for the planned Ebbsfleet Garden City, London Paramount and Thames Gateway area. We actively support seven Quality Bus Partnerships (QBP) and Punctuality Improvement Partnerships (PIP), and we are progressing with the roll-out of smart ticketing to provide seamless travel between operators. The successful Fastrack bus service in Kent Thameside will be developed as growth occurs, and it is exemplary of a high quality bus service. We have to take a pragmatic approach to funding commercially unviable bus services and will seek to support other means of provision that can achieve the same aims, such as community bus services. However, we welcome the potential for KCC to have bus franchising powers to enhance services and create an integrated public transport network. We support the improvement of rail and bus passenger services. More should be done to integrate rail and bus services through combined ticketing, integrated timetables, shared passenger information systems and promotion and development of the Kent Connected website. We also believe that the rail freight should be included in the plan and research and investment into making more freight paths available on the rail network in Kent and beyond and improving the economic viability of rail freight compared with road. Under the Road Traffic Act 1989, KCC has a duty to promote road safety and act to reduce the likelihood of road casualties occurring. We also have a moral and financial imperative to do this. Our target is to reduce the number of killed and seriously injured (KSI) by 33% and child KSI by 40% (2014 to 2020). One means of addressing this is through the Crash Remedial Measures (CRM) Programme which targets safety critical schemes. These are locations where there is a statistically higher than expected number of KSI casualties. At least 50% of the Integrated Transport block funding is top sliced for CRM schemes, for which the programme can be found in annexe 3 to this LTP4. Therefore, at least 50% of transport scheme funding is prioritised for Outcome 3: Safer travel. In addition to this, we carry out a number of educational and enforcement activities, including working with partners in the Safer Roads Partnership. More information on this can be found in the Road Casualty Reduction Strategy. Further, through the highway maintenance programme every road and footway in the county is inspected and repairs carried out where necessary. One of KCC’s primary roles is to maintain the structural integrity of the public highway, which includes targeting potholes for repair, both to ensure safe travel and prolong the life of assets. The Department for Transport (DfT) allocates Highway Maintenance Block funding based on the size of our roads, bridges, and street lighting assets as a proportion of the total asset size in England. From 2018/19 the cycleway and footway network will also be included in the calculation. To make the best use of this, and to support bids for additional central Government funding, we will implement the asset management approach advocated by the Highway Maintenance Efficiency Programme (HMEP) . KCC Highways needs to review the method of assessment as to what constitutes road surface deterioration that warrants repair. Whilst we acknowledge the clarity that a dimensional approach to assessing damage brings, we consider that damage that falls outside of the dimensional definition can create unacceptable increase in risk of an accident. High quality education is a priority, and where transport to school is a barrier we aim to get pupils to school safely and on time. This can take the form of advice or the provision of free or subsidised transport where the child is eligible under Section 509 of the Education Act 1996. The criteria for free transport can be found in the Home to School Transport Policy. We also offer the Young Person’s Travel Pass and this has been instrumental in encouraging school journeys to be made by bus. The Council should promote selection of local schools and active travel solutions for journeys to and from school. We aim to make active travel an attractive and realistic choice for short journeys in Kent. Active travel means walking or cycling as a means of transport rather than for leisure purposes, and it can benefit health and wellbeing by incorporating physical activity into everyday routine as well as reduce the number of vehicles on the road and improve air quality. By integrating active travel into planning, providing and maintaining appropriate routes for walking and cycling, and supporting people through training and building skills, we plan to establish Kent as a pioneering county for active travel. More information can be found in the Active Travel Strategy. ‘Facing the Aviation Challenge’ clearly sets out our position on aviation. This centres on maximising use of existing regional airport capacity, along with some expansion of existing airports and improved rail connections. At the present time, no viable business proposition for aviation at Manston Airport has come forward but Lydd Airport plans to extend its runway and expand its terminal. We are clear that processes are needed to properly measure, minimise and mitigate the noise impacts of existing airport operations and airport expansion. We, along with Medway Council, are robustly opposed to the proposals for a new hub airport in the Thames Estuary. We are also opposed to a second runway at Gatwick; one of the reasons for this is the doubling of the already unacceptable noise impacts. There needs to be an immediate reduction in overflight and noise in West Kent and so we oppose proposed airspace changes that would not share the burden of overflight equitably between communities. Multiple arrival and departure routes should be used to provide periods of respite. Additionally, the level of night flights should be reduced at Gatwick to a level comparable with Heathrow. As part of our view on long-term aviation capacity issues, we are pressing Government for immediate action to keep UK airports competitive with European airports in terms of Air Passenger Duty (APD). This currently has a negative impact on the UK’s global connectivity and is therefore damaging UK business and tourism. Differential charging of APD at uncongested airports could also help to stimulate growth at regional airports and free up capacity at congested airports. 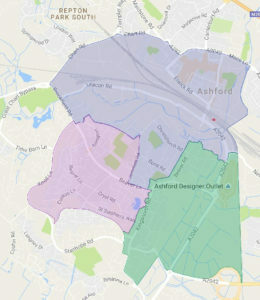 Travel in Ashford is currently dominated by the private car, but the area is largely flat which makes travel on foot or by bicycle easy and feasible. The M20 runs through the district and bisects the town, connecting the area with the Channel Ports to the south and Maidstone and London to the north. Generally, the M20 operates with spare capacity but when Operation Stack is called the town is heavily congested as all motorway traffic is diverted via Junction 9 through the town. Further, the capacity of Junction 10 is restricting development to the south of the Ashford urban area, as both strategic and local traffic place high demand on this junction. A preferred route for a new motorway Junction 10a has been identified and Highways England is currently progressing towards the submission of a Development Consent Order (the approvals process for major infrastructure) to Government in 2016. Ashford is a growing town and development pressures on the transport network must be considered. Ashford is historically a railway town and consequently it has rail connections to Maidstone, Canterbury, Tonbridge, Folkestone and Hastings, as well as internationally via the Channel Tunnel. The bus network includes urban, inter-urban and rural services; and Stagecoach is the main bus operator in East Kent. The A28 Chart Road improvement scheme is critical to the delivery of 5,750 homes at Chilmington Green and the reduction in congestion along this route is a priority scheme for both Ashford Borough Council (ABC) and KCC. ABC also plans to promote Ashford as a Cycling Town. The delivery of an improving cycle network and the doubling of cycle parking at Ashford International Station in 2015 (as well as its 2010 Station of the Year award in the National Cycle Rail Awards) provide opportunities to capitalise on the use of this mode of transport. Highways England are proposing a new M20 junction 10A and link road to the A2070 at Ashford in Kent with a new dual carriageway link road to the existing A2070 Southern Orbital Road (Bad Munstereifel Road) and also connect to the A20 Hythe Road. The improvement of traffic flow through the town, particularly in Station Road/Wellesley Road is needed, otherwise any improvements to these junctions is unlikely to be effective. This should include improved synchronisation of traffic signals throughout the town. Pound Lane Strategic Link (Kingsnorth). We list below the key targets of Ashford Cycling Strategy. The fully strategy can be downloaded from the KCC cycling strategies page. Although Outcome 4: ‘Enhanced environment and Outcome’ 5: ‘Better health and wellbeing’ can be achieved by reduction in car usage and use of low emission road vehicles, there should be reference to these as priorities. provision of electric charging points in car parks and for dwellings and communal car parks in new developments (users of public charging points should pay for use at a viable rate). 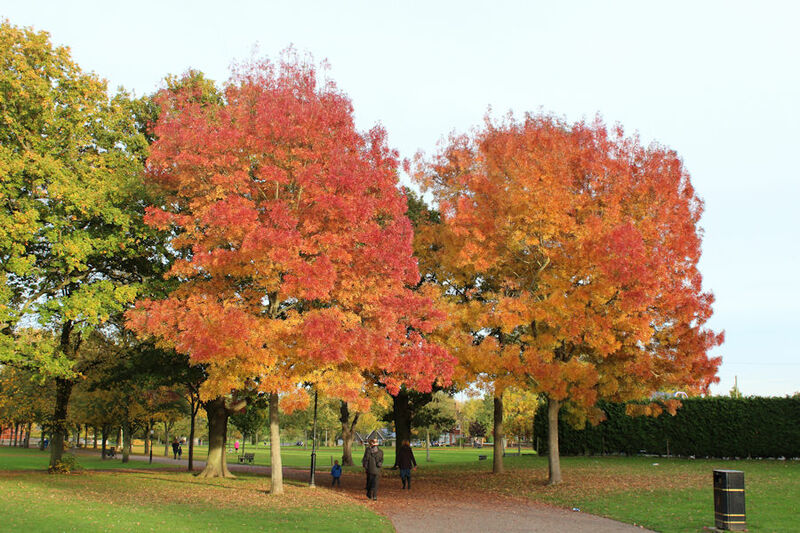 We have posted a copy of the SACF submission to the Commons Select Committee for Communities and Local Government (CLGC) Inquiry into the Future of Public Parks.